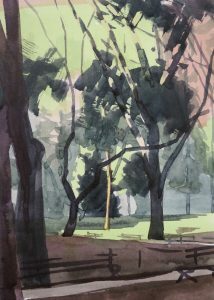 I painted this starting at about 9AM in early September, facing south on the central-eastern path in Washington Square Park. It took me a long time to choose a spot and was drawn to this view by the feeling of the setting rather than by the subject matter. In fact, if I recall correctly, I had been intending to paint a view that was more recognizably Washington Square Park – the fountain, the particular buildings, the arch, something like that. But, in the end, what grabbed me was the trees.